Tip of the Helmet to Wilmington, N.C. Inspired by Stephen Colbert’s “Tip of the Hat,” TheCityFix is starting a new series – “Tip of the Helmet” – to give credit where it’s due as cities invest in sustainable transport, particularly for walking and cycling. To kick off the series, TheCityFix thinks Wilmington, North Carolina, a port city on the east coast of the United States, deserves a Tip of the Helmet for its bicycling infrastructure boom. As public transit agencies around the country are forced to cut services because of budget deficits, Wilmington won a $2 million TIGER grant earlier this year for a new bike trail, which will promote sustainable transportation and increase accessibility for low-income communities in the area. By this fall, the region’s new Cross-City Trail will connect Halyburton Park and the Pine Valley area with Wrightsville Beach and the Military Cutoff corridor. The multi-use trail will cover ten miles, improving accessibility throughout economically distressed areas and areas of low vehicle ownership. Local officials emphasize that the flat and temperate New Hanover County, which includes the Wilmington Metropolitan Area and Cape Fear, should be a biking mecca – it’s just a matter of getting the infrastructure and getting the word out. 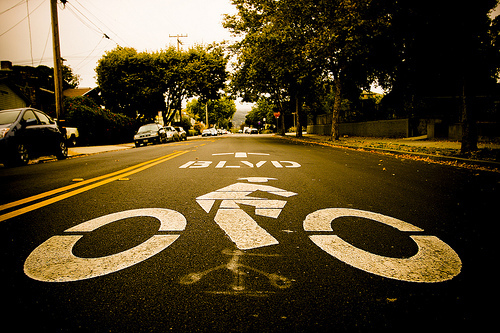 Bike boulevards like this one in Berkeley, Calif. give bikes priority on the roads. Photo via My Standard Break From Life. The city has taken other important steps recently to promote a biking boom. In April, the city opened the state’s first bicycle boulevard, which runs 1.4 miles down Ann Street to the city’s Riverfront Park. Bike boulevards are “a bike way type to attract all cyclists“: they give priority to cyclists, restricting vehicle traffic to an extent that both casual and serious bikers can use them for safer, faster and funner travel! Recognizing the public health benefits of cycling, the North Carolina Health and Wellness Trust Fund gave $60,000 to fund the project. In this news article, County Planner Chris O’Keefe said New Hanover County has also budgeted about $500,000 of federal, state and local funds to add bike lanes and multi-use paths in the Covil Farms, Middle Sound and Bayshore neighborhoods. O’Keefe pointed out that this will make biking a realistic alternative for a large part of the county. Meanwhile, city transportation planner Joshua Mello said the city is trying to get people to integrate biking into their daily lives, for commutes and other short trips. But as OpenPlans’ Nick Grossman pointed out at EMBARQ’s Online Engagement for Sustainable Urban Mobility event, “If you build it, they won’t come.” Nick was talking about building online platforms using digital technology, but that could just as easily apply to building physical infrastructure using bricks and mortar, as well. In other words, Wilmington’s task now is to get people out on the bike trails and boulevards. A reporter for Wilmington’s Star News points out that on a recent Friday trip down the Ann Street bike boulevard, there were no bikes to be seen. Wilmington officials said it would take time for people to “discover” the new infrastructure. But in the meantime, the onus is on city officials to publicize the new bike infrastructure as much as possible, and not just wait for people to discover it on their own.